Days off and I am keeping myself busy with the latest build, a Tiger 1 in 1/35 scale. A happy distraction from the madness that appears to have engulfed the world. Closer to home and my dad is once again in hospital. My parents divorced nearly forty years ago and we have no happy memories of him. Sadly, some of our relatives in Ireland don't understand our anger towards him and are not happy with us. I have thought long and hard about seeing him again and as one cousin said, making peace with him. I realised that I don't have to because I grieved for him many years ago and moved on with my life. He was a selfish man and his addiction to alcohol made our lives...interesting. My brother and I along with my mum bore the brunt of it and in many ways it set me off on the various paths which have brought me here today. Back to the modelling... It is fair to say that I have become slightly obsessed with this hobby. with twenty odd builds under my belt and accessing a variety of media for information, other builds and modellers. It makes me happy and I am at peace doing this hobby. It's fun and I am absorbed in each build. As a kid it was this, reading and cycling that kept me together so that returning to it after many years does feel like I've come home. Add tea, music and the cats and I am a very contented man indeed. If the news reports about the expected winter weather are correct I may have to batten down the hatches, keep warm and model to my hearts content until we emerge blinking in the weak spring sunshine of 2018! For anyone that asks...yes, many of my completed models have the odd cat hair attached. An inevitable consequence of curious cats, glue and paint. Given the long hours and demands that work be completed immediately even if that means working an extra two hours with the inevitable 14 hours day, I have applied for a part time job although it will be running a team. A promotion into management but only for fifteen hours a week. Two days working will bring its own problems in managing a team but the five days off seems to be an excellent pay off for that. It is a rural team where I have worked previously and I have fond memories of working there. The views are certainly better than the artificially lit hospital wards and Emergency Centre where I currently spend most of my working life. I might also get back to cycling on my days off as my plan to cycle to work fell at the first hurdle. Commuting is fine but the frequent follow up visits necessitated my using the car. I'm nowhere fit enough to race a twenty mile round trip to see someone, discover they're not in, return to the hospital in pouring rain to ready myself for an emergency assessment. I can always find an excuse to avoid jumping back in the saddle but running myself into an early grave is certainly a valid one! In other news the modelling continues with my inner nerd being satisfied by yet more completed models with links to the Vickers light 6 ton tank. The Vickers Mark E in Polish colours is there on the left with (l-r) the Polish 7TP, a Russian T26, an Italian M13/40 and the M3 Stuart. 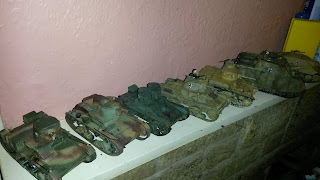 All developed from or influenced by the original Vickers tank and on the far right (pun intended!) are the German Brummbar and the Jagdpanzer 38(t) Hetzer. As I am now discovering, building the models is fine but...where to display the finished products! 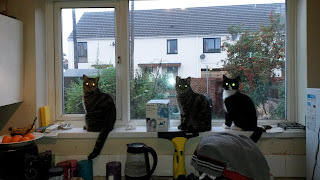 Loads of space but then I have to factor in four inquisitive felines with the widget having a penchant for chewing the models. I suspect I will have to have a clear out of old stuff along the lines of the Döstädning and provide space for a display cabinet. As I believe in recycling I shall enjoy visiting a few second hand shops or car boot sales for the cabinet...there may also be models and books for sale! All in all it is business as usual here in the catto household.